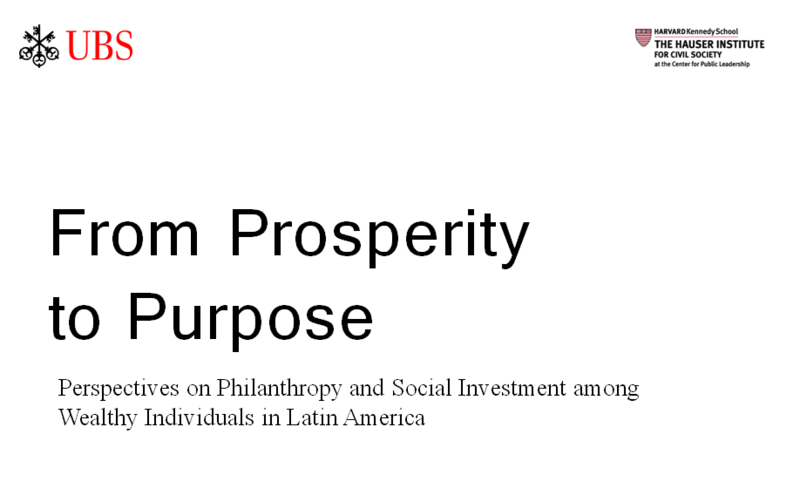 In June, the Hauser Institute at the Center for Public Leadership at Harvard University published a study entitled "From Prosperity to Purpose: Perspectives on Philanthropy and Social Investment among Wealthy Individuals in Latin America". The study sought to explore the private giving and social investment practices of high net worth individuals and families in Argentina, Brazil, Chile, Colombia, Mexico, and Peru. From Prosperity to Purpose produced a report for each country so as to analyze donors’ motivations, philanthropic practices, challenges, and support among other topics. Among the key points found in the study are the prioritization of education across Latin America, the changing view that education and healthcare are no longer only the government's responsibility, the increasing drive for philanthropic projects with measurable, tangible outcomes, and the creativity of philanthropists to overcome barriers of the nonprofit sectors in their home countries. In Colombia, the study concludes that as the country gains political stability and economic growth, and the efforts to foster philanthropic awareness, create a community of social investors, and engage future generations continue, "private giving and social investment will become an inextricable part of the country’s social fabric". The report was supported by UBS and is available in English, Spanish, and Portuguese.